Learning with games is always a hit at our house. We’ve been playing a brand new product from Sunya Publishing, a card game called The Magic and Wonder of Math and Science Adding & Subtracting. The game is not yet available for purchase, but will be available very soon, so keep checking the website if you’d like a copy for your family. The Magic and Wonder of Math and Science Adding & Subtracting includes a spiral bound teacher/parent guidebook and 60 playing cards. To play the game use the cards to form two decks- one with the fact and riddle cards and the other with number, wild, and operation cards. During game play, players use cards to make correct number sentences. At each turn the player uses cards from her hand to create a new correct number sentence. The game cards can also be used as flash cards, in sequencing, matching and making equations. My children who are still working on memorizing math facts are still 2nd grade and younger. So, I found this game a little too difficult for my children to play, though we really enjoy the cards for simpler things like flash cards and making simple number sentences together. Sunya also offers a similar game for Multiplying & Dividing, and I believe my older children would really enjoy the multiplication and division games, as they are old enough to really remember and enjoy game rules. Keep your eye out for the release of these fun new games from Sunya! 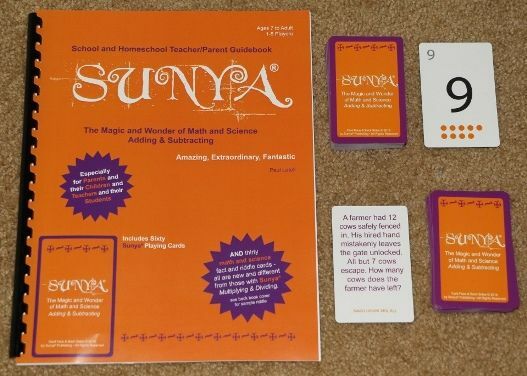 Click below to read more reviews of Sunya math games from The Schoolhouse Review Crew.